Yvonne Mason knows a few things about grammar. She taught English composition for 17 years in public schools in South Carolina. Mason has since retired, but the veteran teacher recently received a letter calling publicly for her "stylistically horrific" prose. It was a White House letter signed by President Trump. Earlier this month, Mason posted a photo of the letter, covered in purple ink and dull editorial criticism. Got a letter from Mr. Trump. Will it return tomorrow. "Have you already tried Grammar and Style Check?" Mason wrote on top of the letter, interrupted by two asterisks. "Oh, that's wrong!" she wrote at the bottom, citing one of many false uses of capitalization. She conceded that she knew that a White House employee – not Mr. Trump himself – probably had made the letter. But Mason could not hide her disappointment at his quality. "If you receive letters from the highest levels of government, expect them to be at least mechanically correct," Mason told Greenville News. 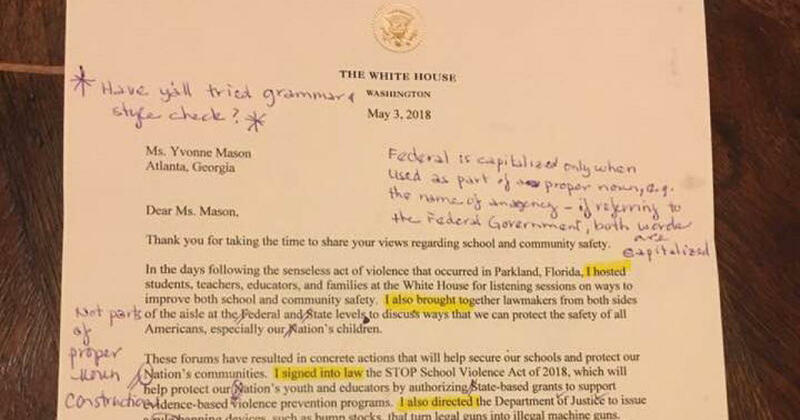 Mason also seemed to mind the overuse of the "I" in Mr. Trump's letter, as the pronoun, which is highlighted five times in yellow, proves. "If it had been written in middle school, I would give it C or C." Besides, "Mason told the newspaper," If it had been written in high school, I would give it to D. "